Aloha! I’m alive! I know I dropped off the face of the earth. A couple of days ago my husband called me a surprised me with a trip to Hawaii! So I’ve been running around like a mad woman getting ready. Now that I’m here, I’m relaxed. I did a little surfing yesterday and burned my buns snorkeling today. Macadamian nuts, cookies, cake, and pineapple we were welcomed with. But I’m not going to leave you totally in the dark. 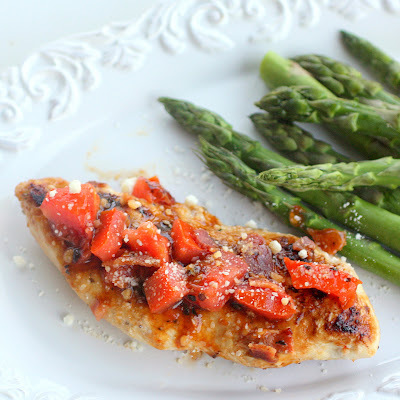 I’ve been posting over at Tablespoon and here’s my latest Sun-dried Tomato and Bacon Chicken that my husband said tastes like pizza. Don’t worry. I have a line up of Super Bowl recipes that you are going to love! Yummo – this looks amazing! I know my family would love it! You lucky girl!! Hope you are having a wonderful time! Hawaii is so much fun! Enjoy your trip! Congrats on your surprise trip! Enjoy your time away. That looks amazing. Sun dried tomatoes are incredible. Have fun in the sun! I love sun dried tomatoes! This looks fresh and healthy too. A surprise trip to Hawaii?! Sounds amazing!!! Have a terrific time.